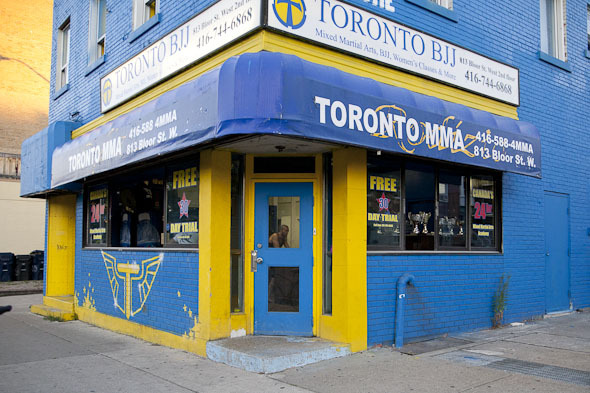 Toronto BJJ sits directly between Ossington and Bathurst at 813 Bloor Street West. The two storey blue and gold brick building opened its doors in 2006, and now instructs over 600 students. 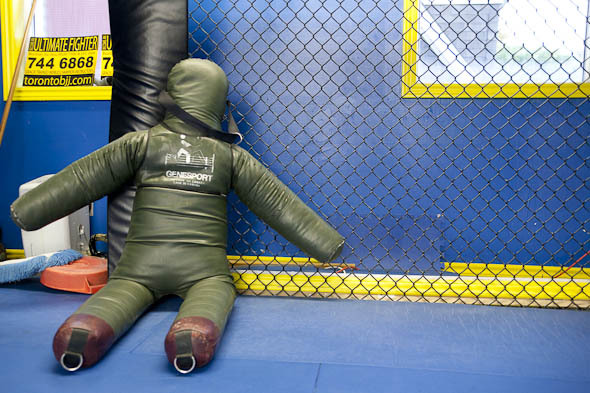 At 9000 square ft (3000 of which is pure mat space), it's the area's largest Jiu-Jitsu gym. I had a difficult time reaching anyone through e-mail, but a phone call was answered by friendly staff. Trial lessons are by appointment only, and require at least 24 hours notice, so I booked an appointment for a BJJ Basics class. For trial lessons, there's also Muay Thai or MMA (mixed martial arts), and women-only options exist for BJJ and Muay Thai. Once you sign up, submission wrestling and Judo become available. The following Saturday, I arrive for my trial lesson and get handed a loaner gi (uniform). The friendly clerk gives me a tour. 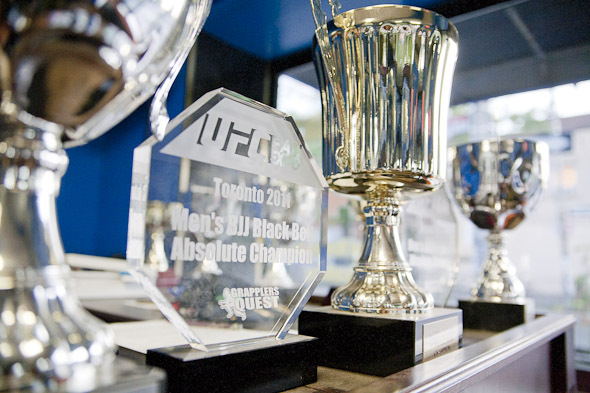 Tournaments (and winning them) are common here, as evident by the trophies found in each room, Toronto BJJ recently won 7 medals at the 2011 IBJJF World Championships. But competing isn't just for students: Head instructor Jorge Britto (a 2nd Degree BJJ Black Belt) is a World No-GI Masters Absolute champion, as well as 5x Rio State champion. Britto's teachers have included BJJ founder Helio Gracie, as well as Royler Gracie and Saulo Ribeiro. The actual training area spans the entire second floor. Every inch is rubber coated, including the walls, and houses a caged corner for MMA training. Class begins, the warm-up is just that: enough activity to get the blood flowing, but not so much that you're exhausted before class begins. Being my first class, one of the senior students takes me and another prospective student aside, running us through some basic techniques. Rather than expect us to jump right in, we get one-on-one instruction. The guy teaching us has the tell-tale cauliflower ears of someone who has trained hard, and doesn't for a moment act like he'd rather be somewhere else. Somewhere in this, Jorge Britto runs over and tries a new technique on our teacher. Satisfied, he returns to the class, using what he just tried as a lesson for the rest of the class. This tells me something: The school houses champions, and knows what works, but is still adapting and learning new skills at any moment. Watching his students, Jorge sits and drinks coffee. But, far from being passive observer, he repeatedly comments on students' technique and jumps up to physically correct them, shifting a shoulder or changing a hold to make it more effective. After the class is over, I'm asked if I'd like to sign up for another. During my entire experience, I have never been hard-sold or pressured to sign up for anything beyond my trial. My one gripe: no one will tell me class fees. Reception doesn't know, and the only way to find out is to book an appointment with staff. While they offer a 30 day free trial, as well as a 60 day money back guarantee, a little more transparency would be appreciated.